The bus is usually on time here in the morning. For some reason I didn’t expect it, though my only other bus riding experience was as a undergraduate at Indiana, and that was when Bloomington almost seemed like a big place because you needed a bus to get to and from campus. Though at 175,000 people, it was almost exactly 10% the population of Budapest, which itself is only about 20% the population of New York City. But for a good part of my life, I grew up in a town of 13,000 people. On an icy day in the middle of winter in the middle of morning rush hour in the middle of the week, it still only took me fifteen minutes to drive to school. 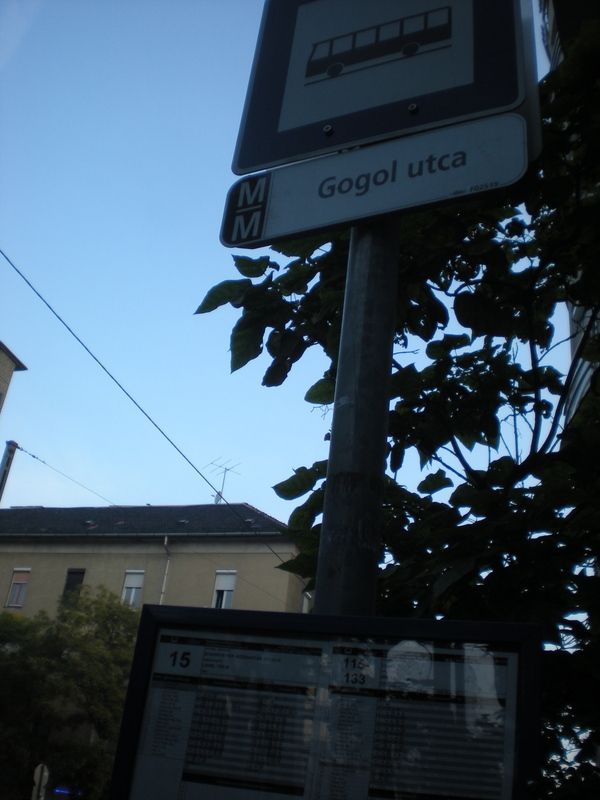 Now I walk five minutes (relatively short mind you) to the Gogol utca stop. On the weekdays, bus 15 stops there almost every ten minutes. 5.8 Kilometers (3.6 miles) and between twenty and forty-five minutes later, I arrive at work: Nokia. I’m calling it work because it’s the place where I teach five business English classes and is where I spend most of my teach-work time. A lot of people have been asking me how it compares to teaching University classes in America or in an American High School. Though I’ve never taught in an American High School, my mom is a nearly retired High School business teacher and my brother has been teaching 7th and 8th grade History for over a year now. And with my experiences, and their stories, I’m pretty sure that there are far more classroom differences than similarities. I teach five intermediate to upper intermediate classes. In only the first few weeks, I’m pretty sure that I can say that by comparison, American schools are in a bit of trouble, or rather that the education mess that’s been piling up for the last eight years has really done some actual damage to American students. It’s true that my Hungarian students are relatively young businessmen and women (mid to late 20s), and are success oriented and motivated to learn English for corporate adaptability and career viability. So in many ways, it’s not fair to compare them to, let’s say, one of my mom’s 16-year-old business students. But the students here are very active learners. They are respectful, participate, ask questions, and take notes. It was really shocking actually to see that everyone was doing exactly what I asked them to do during the first lesson. Talk to your partner. Tell me what words are unfamiliar. Write a short paragraph. No request was met with a growl or an eye roll. Even in the 7am class, with the prospect of an entire day of accounting work still ahead of them, everyone was there to learn something and even smiled from time to time. I’m not sure if it has anything to do with or say about cultural differences. And countless people espouse the superiority of European teaching systems compared to American, and I certainly can’t speak to that. But American students can’t afford to be lazy learners, nor accept an isolated one-language existence. Here, young professionals learn because they have to learn to communicate cross-culturally. They have to be on conference calls with suppliers in Finland or Tokyo or America, and English is still the language of business. So even though Americans are still native-English speakers and are still learning English in schools, the aspect of learning to communicate better with someone else is almost altogether deemphasized in favor of darkening the test circles: which sentences uses the present perfect continuous tense? It’s no wonder freshman composition instructors in American universities get students who can’t write in complete sentences, or make subjects and verbs agree, nor a wonder that many intermediate to upper intermediate non-native speakers have a better vocabulary than some of those freshman. I’m a big believer that students want to be listened to, not lectured at. They want to participate if only what they have to say is valued. I feel really lucky that I’m classrooms with students who want to be part of a larger conversation. Who want to learn vocabulary words so that they can say it more clearly for the sake of someone listening. I think this a core value that has been lost in language arts education in America, and I really hope that in the next few years, teachers will once again be allowed to actively educate, read books, have conversations, so that students will get back to learning—not for taking a test, but for participating more fully in the world. Amen. I was really disappointed that the last debate didn’t dedicate more time to education. I’m so glad you’re enjoying your classes! That’s the problem with the debates/election/politics now–no one is dedicating time to any important issues. My dad makes a good point on his blog, actually, check it out. But this is how it goes. Talking around things and nothing gets done anyway.